The most widely used boiler types in the UK are combi boilers, system boilers and conventional boilers. 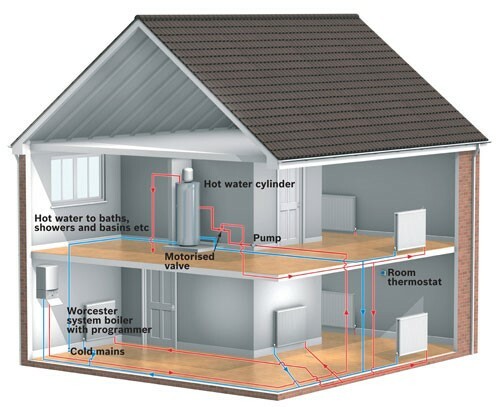 Each boiler type differs in the method of providing heating and hot water, and each type has its own advantages. Combi boilers are the UK’s most popular choice as they allow households the luxury of a small energy efficient system without the need for cylinders or tanks that use valuable storage space. We would recommend a combi conversion if you live in a property that is 2 bathrooms or less and currently has an old ‘conventional’ system. However, if you have a busy household with 3+ bathrooms and need large quantities of hot water, we would suggest replacing your boiler with a more efficient but similar heat only option. If you are not sure, you can read more about boiler types below or give us a call and we’ll help you decide. Our friendly expert team are available to answer any questions and queries that you may have when choosing the right boiler for you. Call us on 0800 915 3322 to find out more! A combi boiler heats water instantly when you turn on a hot tap. 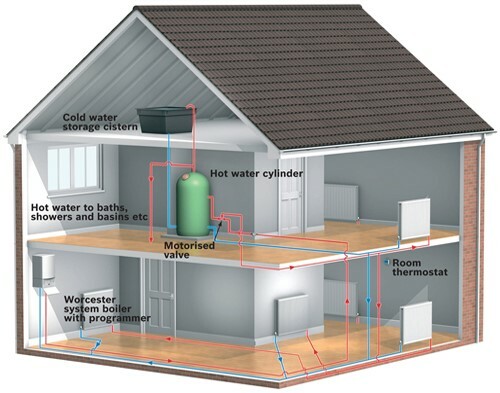 It does not need a cold water expansion tank or a hot water cylinder, which can free up precious storage space. The water it heats comes straight from the mains, so the flow rate at the tap is usually very good. A new combi boiler can be 90% efficient so replacing an old ‘conventional’ boiler can provide substantial savings. Combi boilers are suitable for small to medium sized homes with between 1-3 bathrooms all requiring hot water from your boiler. System boilers are suitable for larger, family households with a greater need for heating and hot water. We would typically fit system boilers in homes with 3-5 bathrooms. 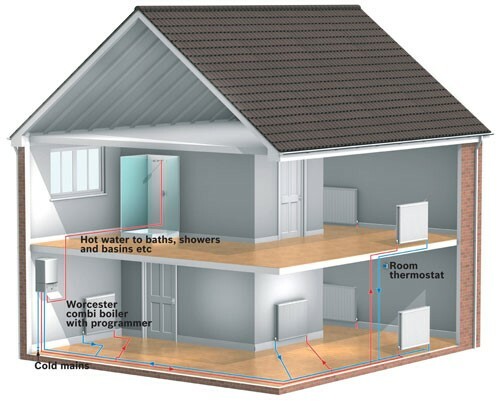 System boilers require a cylinder for storing hot water, however the main heating components necessary for this are housed within the boiler itself, which allows for a quick and easy installation. Conventional boilers are often found in older homes that haven’t updated their system. They use an expansion tank in the loft to store cold water and a hot water storage cylinder & pump to move hot water around the system. If you are updating your system and live in a 1 or 2 bathroom house, you should consider the benefits of converting to a combination boiler. However, if you live in a larger house with 3 or more bathrooms, we would suggest staying with a heat only option. Get your new boiler installed by local, certified engineers from quote to install within 24 hours.